(Ace Records) 28 tracks with 24 page booklet. Two Trendsetting Traditional Cajun Albums Made For Swallow Records, With Rare Singles As Bonus Tracks. The Booklet Includes An Illuminating New Essay By Ann Savoy And Full Lyrics In French With Englisch Translations. Some projects take on a happy life of their own, and this is one of them. In the summer I was approached to supervise the revamp of the old Balfa Brothers’ 2 LPs-on-1 CD, released in the early days of CD production in 1990. Specifically, I was asked if Louisiana musician and author Ann Savoy would be available to write a new essay. If she was able to take on the task, she would be the perfect choice. After all, she had known and played with the Balfas and had written up their story in her acclaimed book, Cajun Music: A Reflection of a People. Yet I knew she was embarking on a UK tour as a member of the Savoy Family Band, with husband Marc and sons Joel and Wilson. Would she have the time? Not only did she accept the commission with charm and alacrity, but she met her deadline with ease. 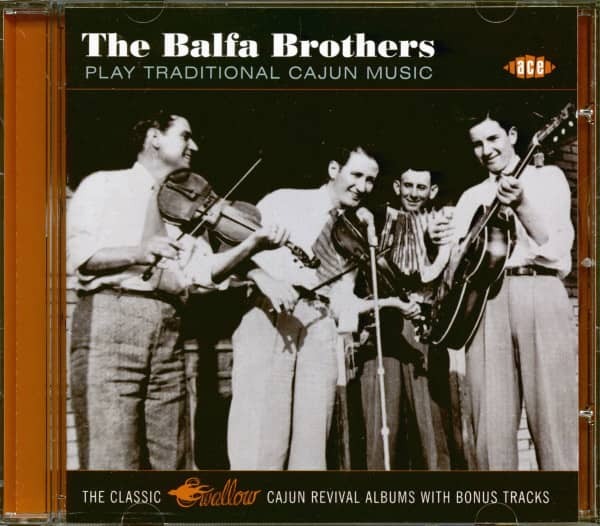 Now even more light is shed on the Balfas’ fascinating story, as fully documented in the booklet (with great photos, label shots, LP reproductions and Cajun French-English lyric translations). The mastering, of course, has also been updated and upgraded. What made the original LPs so important is that they marked a return in the 1960s and 1970s to traditional Cajun music, which had been left behind by the Cajun honky-tonk sound, itself on life support. 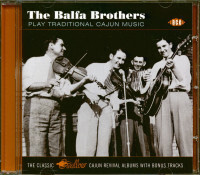 The back story here is that leader and virtuoso fiddler Dewey Balfa convinced Swallow Records boss, Floyd Soileau, to record the brothers when Floyd was reminded that Dewey had recorded an in-demand but long unavailable Cajun song, ‘La Valse De Bon Baurche’, for Khoury’s Records way back in 1951. 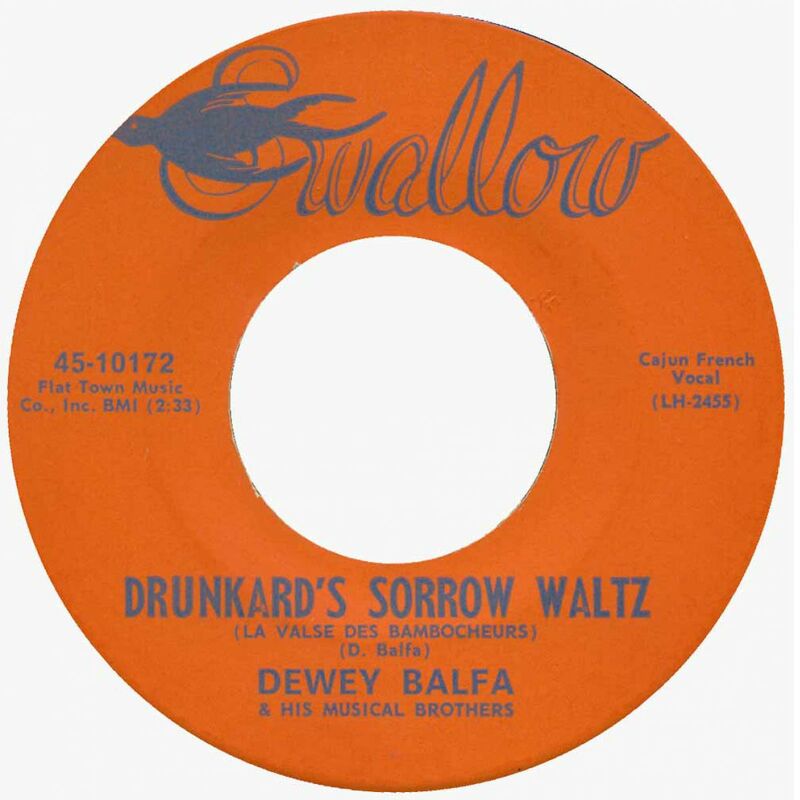 It came out on Swallow in 1965 as ‘Drunkard’s Sorrow Waltz’, the Balfas’ first single. The 1965 and 1974 Swallow albums ensued and are presented here with two rare 45s from 1977 and 1980. The latter single features all-time-great accordion player Nathan Abshire, with whom Dewey recorded and played for many years. How did Ann Savoy first encounter Dewey? And what are her thoughts on the Swallow LPs? Let her explain: “I met Dewey Balfa before I heard his music. He came into Savoy Music Center [outside Eunice] looking very French and elegant in a fedora and black sunglasses. He was just stopping by for a cup of coffee and a visit but I was so impressed by him, his beautiful French, his character. He and Marc were close friends and so we often cooked suppers together and played music in the yards of our houses. “I heard his LPs later and immediately fell in love with them. After spending many evenings in Cajun honky-tonks the acoustic feeling of the Balfa Brothers music was refreshing. In these recordings without amplification I could hear the natural resonance of the instruments and the subtleties in the vocals. They also played songs not heard in the dance halls: haunting, sad songs. These LPs were jewels, and I was very touched by them. 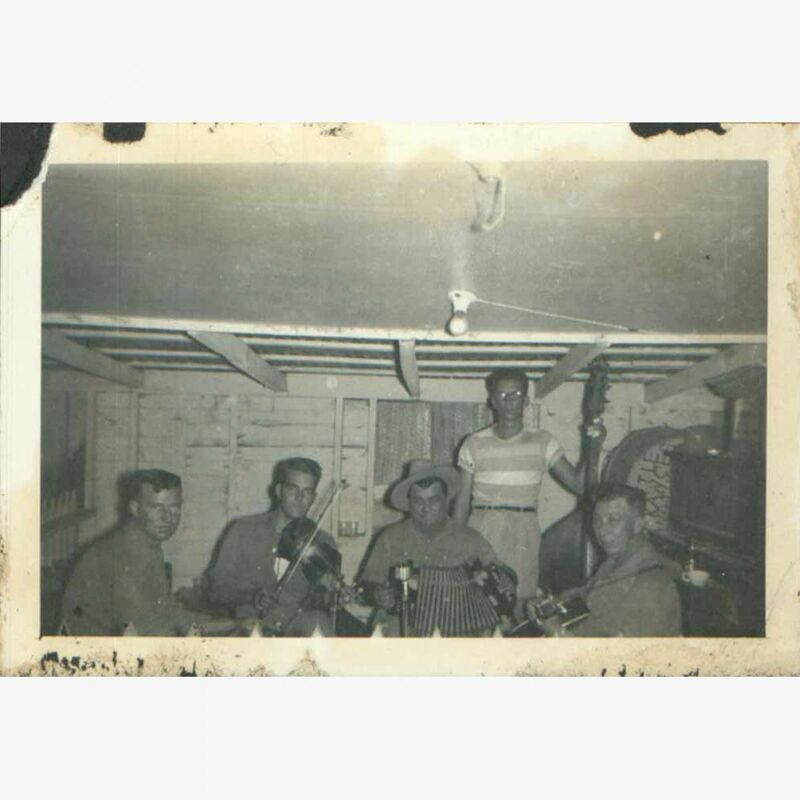 “I travelled all over the United States and France with Dewey and Rodney when Marc was playing accordion and twin fiddle with them. These were exhilarating times; great fun and full of camaraderie. And of course the music was brilliant. We also went through tragedies with Dewey: the deaths of brothers Rodney and Will, and Dewey’s wife Hilda. But he always bounced back, full of energy and fun until his own illness at the end of his life. I think you can understand what I mean about this being a special project. 01 Drunkard's Sorrow Waltz (La Valse Des Bambo.. 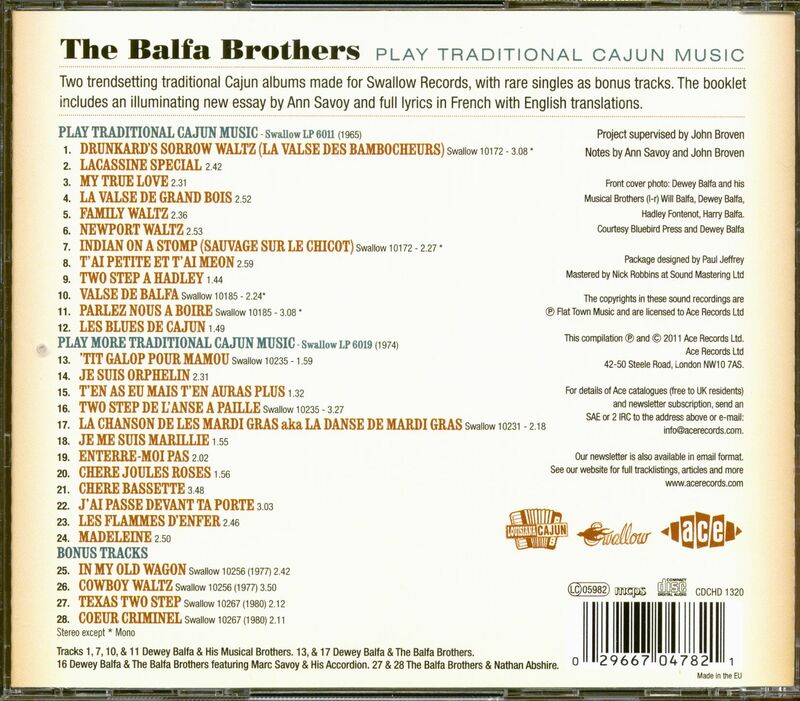 Customer evaluation for "The Balfa Brothers Play Traditional Cajun Music (CD)"